When learning how to read sheet music you need to ask yourself 3 questions about a note’s appearance in order to work out its length…. Is the notehead filled in? Does the note have a stem? Does the stem have a tail? These 3 variables combine to tell you how long a note should be held for. It’s much easier to show you this rather than try to explain it. Have a look at this table…. You can see that the quarter note (crotchet) has a filled notehead, a stem, but no tail. 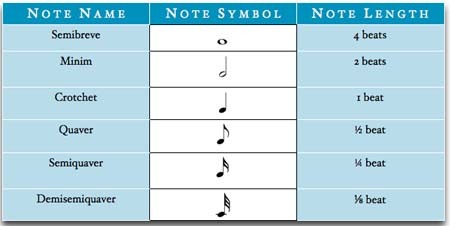 If you un-fill the notehead and remove the stem the note length gets longer. 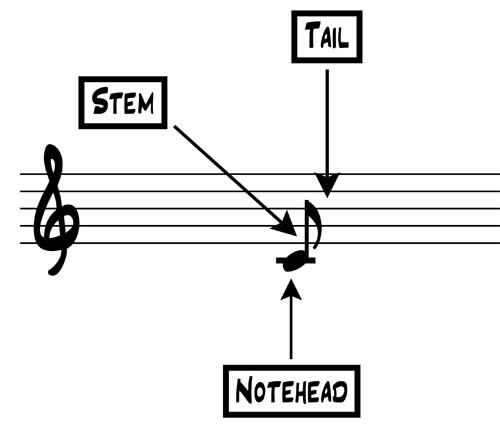 If you add more tails to the stem, the note gets progressively shorter. What about Notes With Beams? Many of my students get confused over beamed notes – the good news is that they are actually very simple. If you put 2 eighth notes (quavers) next to each other, instead of writing 2 separate notes with 2 tails you join the tails together to make a beam. So, all the notes in the score below are the same length…. You can do the same with 2 sixteenth notes (semiquavers) by joining both the pairs of tails together to make 2 beams…. You can even mix and match…. Hopefully this is pretty clear to follow. However, it’s really important that you get PRACTICAL with theory. Why not sign up for your FREE Video Lessons Starter Pack below and you will get instant access to video lessons, practical activities and a FREE Wall Chart to help you take your musicianship to the next level.